What is YHWH OUR﻿ RIGHTEOUSNESS﻿? 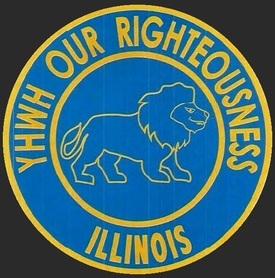 YHWH OUR RIGHTEOUSNESS is a tax-exempt organized movement founded on September 28, 1986, by YHWH OF HOSTS, to magnify His Holy Name, to make Yerusalem a praise in the earth and to prepare the way before Him. YHWH, for His Holy Name sake has established YHWH OUR RIGHTEOUSNESS also to gather the preserved of Yisrael and to be a light unto the Gentiles that His salvation can go to the ends of the earth. YHWH OUR RIGHTEOUSNESS is the servant of YHWH, our righteousness, The King, the fountain of living waters, the spirit and creator of all things, The Living Creator. YHWH OUR RIGHTEOUSNESS is also the name by which the seed or branch of David is to be known as prophesied in Jeremiah 23:1-8. Jer 23:1-8 KJV (1) Woe be unto the pastors that destroy and scatter the sheep of my pasture! saith the LORD. (2) Therefore thus saith the LORD God of Israel against the pastors that feed my people; Ye have scattered my flock, and driven them away, and have not visited them: behold, I will visit upon you the evil of your doings, saith the LORD. (3) And I will gather the remnant of my flock out of all countries whither I have driven them, and will bring them again to their folds; and they shall be fruitful and increase. (4) And I will set up shepherds over them which shall feed them: and they shall fear no more, nor be dismayed, neither shall they be lacking, saith the LORD. (5) Behold, the days come, saith the LORD, that I will raise unto David a righteous Branch, and a King shall reign and prosper, and shall execute judgment and justice in the earth. (6) In his days Judah shall be saved, and Israel shall dwell safely: and this is his name whereby he shall be called, THE LORD OUR RIGHTEOUSNESS. (7) Therefore, behold, the days come, saith the LORD, that they shall no more say, The LORD liveth, which brought up the children of Israel out of the land of Egypt; (8) But, The LORD liveth, which brought up and which led the seed of the house of Israel out of the north country, and from all countries whither I had driven them; and they shall dwell in their own land. YHWH OUR RIGHTEOUSNESS is the beacon to the people of the earth and when YHWH brings it to Yerusalem, then it will be the lamp that burneth bringing forth YHWH's salvation to the inhabitants of the earth. (17) One thousand shall flee at the rebuke of one; at the rebuke of five shall ye flee: till ye be left as a beacon upon the top of a mountain, and as an ensign on an hill. YHWH OUR RIGHTEOUSNESS is also the name by which the capital of Yisrael, Yerusalem, is to be known as prophesied first in the eighth century BCE by the prophet Isaiah in the 62 chapter, verses 1 and 2. Isa 62:1-2 KJV(1) For Zion's sake will I not hold my peace, and for Jerusalem's sake I will not rest, until the righteousness thereof go forth as brightness, and the salvation thereof as a lamp that burneth. (2) And the Gentiles shall see thy righteousness, and all kings thy glory: and thou shalt be called by a new name, which the mouth of the LORD shall name. 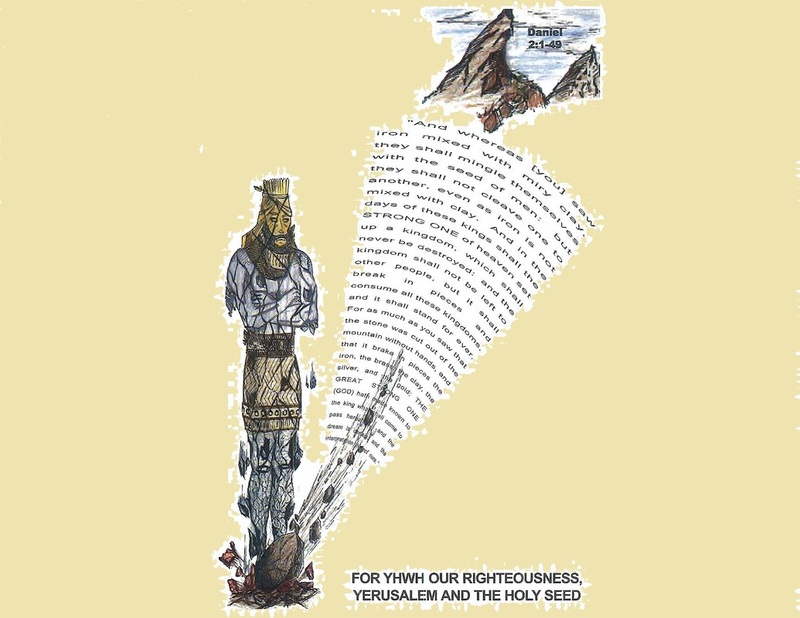 Moreover, YHWH spoke through the prophet Jeremiah, in Jeremiah 33:14-26, that Yerusalem shall be called YHWH OUR RIGHTEOUSNESS. This name, YHWH OUR RIGHTEOUSNESS, shall be the name of Yerusalem until the temple is built and YHWH returns to His dwelling place in the midst of the children on Yisrael (Malachi 3:1-6, Ezekiel 43, Zachariah 2, and Zachariah 8); after that the name of Yerusalem shall be called YHWH IS THERE (Ezekiel 48:35). Jer 33:14-26 KJV(14) Behold, the days come, saith the LORD, that I will perform that good thing which I have promised unto the house of Israel and to the house of Judah. (15) In those days, and at that time, will I cause the Branch of righteousness to grow up unto David; and he shall execute judgment and righteousness in the land. (16) In those days shall Judah be saved, and Jerusalem shall dwell safely: and this is the name wherewith she shall be called, The LORD our righteousness. (17) For thus saith the LORD; David shall never want a man to sit upon the throne of the house of Israel;(18) Neither shall the priests the Levites want a man before me to offer burnt offerings, and to kindle meat offerings, and to do sacrifice continually. (19) And the word of the LORD came unto Jeremiah, saying, (20) Thus saith the LORD; If ye can break my covenant of the day, and my covenant of the night, and that there should not be day and night in their season; (21) Then may also my covenant be broken with David my servant, that he should not have a son to reign upon his throne; and with the Levites the priests, my ministers. (22) As the host of heaven cannot be numbered, neither the sand of the sea measured: so will I multiply the seed of David my servant, and the Levites that minister unto me. (23) Moreover the word of the LORD came to Jeremiah, saying, (24) Considerest thou not what this people have spoken, saying, The two families which the LORD hath chosen, he hath even cast them off? thus they have despised my people, that they should be no more a nation before them. (25) Thus saith the LORD; If my covenant be not with day and night, and if I have not appointed the ordinances of heaven and earth; (26) Then will I cast away the seed of Jacob, and David my servant, so that I will not take any of his seed to be rulers over the seed of Abraham, Isaac, and Jacob: for I will cause their captivity to return, and have mercy on them. What is The Arm of YHWH? The Arm of YHWH is YHWH OUR RIGHTEOUSNESS. The Arm of YHWH is comprised of the seed of David, the seed of Levi, and from the seed of Levi also the high priest from the line of Zadok. YHWH, The Creator, has an everlasting covenant with these three entities that abide in Yerusalem. These three are known as the inhabitants of Yerusalem, they are the Arm of YHWH. 2 Sa. 7, and Num. 8 Num. 18, Eze. 44:15-31. YHWH OUR RIGHTEOUSNESS has established His arm in the midst of the daughter of Babylon (United States of America) as was prophesied in (Num. 24) (Isa. 52). Behold your Strong One: YHWH, The King!